There are days when not even a quadruple shot pumpkin spice latte can give me the perk I need to put on my “Polly Anna” tinted glasses and face the day. On those days I call Patrick Taylor who reminds of my Greater Purpose. When he answers, I sometimes hear the clink and clank of metal on metal in the back-round as Pat takes a break from his work out to answer. “Hello,” Patrick answers, sounding a bit out of breath. It’s a good sign when I can hear him huffing and puffing on the other end; it means he’s at the gym and not at the hospital. Patrick is battling Stage Four Multiple Sclerosis but instead of taking his diagnosis lying down he’s taking it to the gym where he is training for the Para Olympics. However, his motivation isn’t a gold medal; it’s the dream of reaching thousands of people and proving that Multiple Sclerosis isn’t a death sentence. “I learned how to fly that day,” Pat jokes. The accident slowed down Pat’s training considerably but he will tell you the setback just pushed him to work harder. 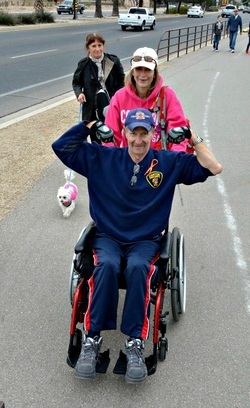 When Pat’s not at the gym you’ll probably find him with the love of his life, his wife Kathy Taylor, or out in his wheelchair “on a run.” That’s how Patrick wheeled into my life a few years ago. I was working as a reporter for the CBS affiliate, KOLD NEWS 13 in Tucson, Arizona. It was a little after six a.m. and I was out doing a live-shot at the Wells Fargo on Oracle Road. My station was helping to “Stuff the Wells Fargo Stage Coach” with food donations to help stock the shelves of The Community Food Bank. When amidst the cars and passers by I saw a man in a wheelchair heading towards me. Patrick wheeled up in his chair with a huge smile on his face sporting a firefighter T-shirt and a donation on his lap. In minutes, Patrick had everyone gathered around him as he told stories dotted with his signature corny "Pat"jokes. We chatted for a few minutes and I learned he was in the middle of a 14 mile run, heading to the gym. A week later I found myself on Oracle Road performing another live shot for the news station; this time calling on the public to donate toys for an orphanage. Right on cue, a little after 6 a.m. I see Patrick wheeling towards me with the Arizona sun rising in the distance. This time he carried a shiny, red fire truck in his lap to donate to the children. I knew at that moment I was meant to share Pat's story. When I share Pat's story with others, sometimes I see goosebumps crawl up their arms, that's when I know I've fulfilled my Greater Purpose as a storyteller. Now I'm on a mission to seek out the "Patrick Taylors" in this world and share their stories as well.